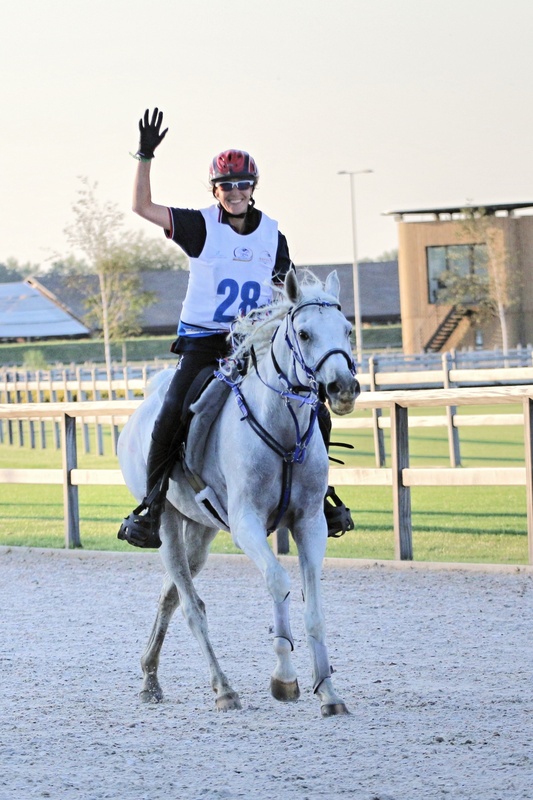 Our first FEI 4* Championships – our adventure to Samorin, Slovakia with LR Bold Greyson I had always dreamt of riding for Great Britain and having the opportunity to take my beautiful white Arabian gelding LR Bold Greyson to the European Championships really has been a dream come true. I believe in going out there and living life to absolute capacity and making the most of every single second, and attending the European Championships in Samorin at the Napoli equestrian centre has been an absolute blast from start to finish. 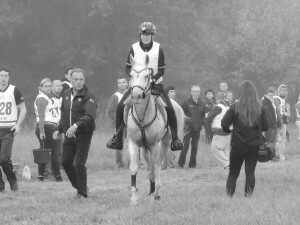 Preparations began a very long time ago, I knew I needed to up my game and also get more experience before I could tackle a championship – luckily my work commitments abroad gave me the opportunity to ride in different locations in very big starts, over varied terrain with a whole variety of horses. I also had the opportunity to meet a lot of people, and to gain huge amounts of help, advice and most importantly friends from around the world. All dedicated to the sport of endurance. In the meantime I was working hard to establish my preferred methods to train my horses at home and to build my dream team of professionals, family and friends who would come on the journey with me. 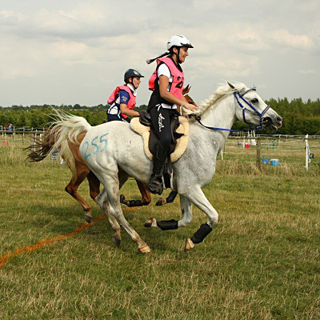 LR Bold Greyson first entered my life when I crewed for him for his then owner Chris Yeoman, prior to the 2012 Endurance Championships. I looked up his track record in the USA and then as chance would have it he came up for sale. Unfortunately I did not even get the chance to sit on him as he was lame when I purchased him following a tendon injury. However, I knew that from his past history that he was a great horse and was happy to give him the year off that he needed and to work hard on his rehabilitation. Living close to Newmarket also gives me access to some of the top equine experts in the world. When I brought Greyson back into work in 2014 I took things very steadily, I was so worried about whether he was recovered enough to handle the rigorous strain of endurance riding and training. So the three rides we undertook that year were done on absolutely minimal training. You can imagine how delighted I was therefore to win his first ride, a 80km FEI 1* at Keysoe ! I then took him to Barbury Castle for a slow and steady FEI 2* 120kms, before travelling to France for the FEI 3* 160 kms at Madine, where he came 3rd. Yes – Greyson was back. By pure chance I ended up sitting next to Greyson’s breeder John Crandell whilst helping my US friends at Sartilly for WEG, I was delighted to update him on our progress. From there we went on to following the requirements of team training and assessment for EGB, which included a lovely day out at Horses First, where I knew Greyson was flying, and looking amazing. As part of my training I took Greyson to Kings Forest to the FEI 2* as a pre-ride, and he gave me a magnificent performance coming in second. Tricia Hirst and I had a great fun ride out and a racing finish. Happy Days. This was of course followed by the obligatory long wait for the season to roll round to selection. Sadly for us on this, our first occasion, there was to be no team for a whole variety of reasons. However Fiona Griffiths on Oliver Twist, and myself with Greyson, both got the green light to Go to Samorin with the EGB management team. We had already made a full and comprehensive travel and preparation plan in the event that we would get to go, and this now kicked into action at full pace. Before we knew it, it was time to leave. We were travelling extra early to allow for the 3 day journey across Europe and to stay at a quiet stable location away from the main venue. Talking of which, the venue ! wow what a venue. Courtesy of Mario Hoffman and Napoli Equestrian, we were given a real treat. The state of the art facilities and absolutely beautiful equestrian centre, was spectacular. I just could not believe that we got to go there, and to compete at this level. 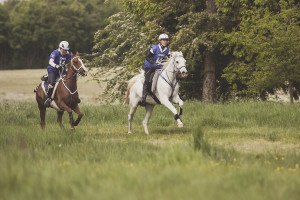 Myself and my crew had already attended an FEI ride in Samorin in order to familiarise ourselves with the surroundings and to recce the course. Coming from the flat land of Norfolk, anything remotely resembling a hillock looks pretty big to us. So the steep climbs and rocky going that would be loop 2 were going to be tough for us. I also knew the flatter sections could be very fast going. Both eventualities that I needed time to evaluate properly and make a robust game plan that would be achievable for Greyson and I. I strongly believe in setting yourself up for success. I wanted to be able to look everyone in the eye, and say that I had given it my best shot no matter what the outcome. Whilst staying at our stabling away from the venue I spent my days pampering to Greyson’s every whim and ensuring that he was in tip top condition. We also made from wonderful friends and enjoyed the Slovakian hospitality and countryside, not to mention the fact that this is an exceptionally good wine growing region ! 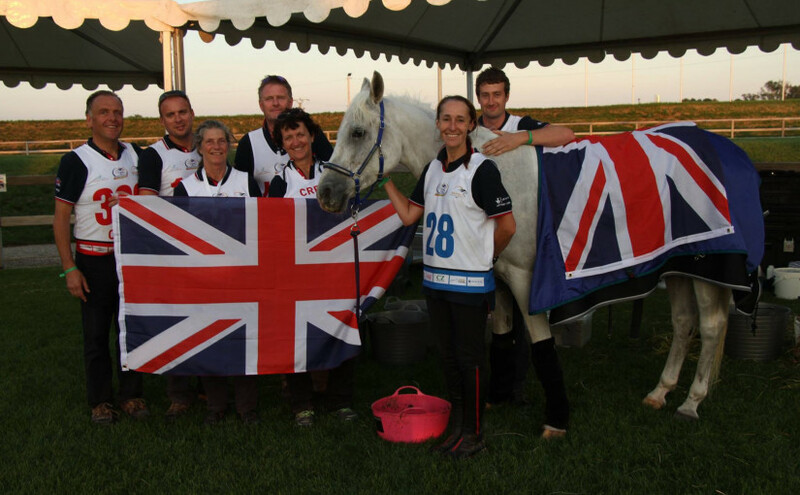 It was soon time to move to the venue, the management team arrived, and we met up with Fiona and her team, and of course her horse Oliver. The last couple of days flew by in a blur and suddenly it was as though there was no time left and it was the Opening Ceremony. Greyson meanwhile was taking it all in his stride, having travelled across Europe, settled into a quiet Shagya stud and endurance stable, and then moved to a very busy competition location, he proved again and again what a reliable and beautiful natured horse he is. Our final game plan discussions were difficult – I knew I had to watch my speed in the hill loop, loop 2. But I also didn’t want to get caught completely at the back of the field. My preference is to start at a canter mid field, it is what the horses are used to and is a good way to settle them. Team discussions took place around starting more at the back and trotting out. The morning of the Championship arrived and in the early morning mist Greyson took charge of the decision around the starting pace and made it clear that he wasn’t hanging around at the start and that he was fully prepped and ready to go. We porpoised out of the venue but at least he didn’t buck me off ! it was just high jinx and exuberance on his part and a clear message that I should have stuck to the game plan and cantered out mid field! All my fears about whether he was prepared enough vanished as he proceeded to pull my arms out until the very last loop ! We started in the half light and cantered strongly past the banks of the Danube (which is Very blue !) and on towards the remote vet gate. We had a series of bridges to negotiate on the way to the first vet gate, including some low ones entailing a good duck around your horses neck whilst praying that the train would not come overhead at the same time ! I was very grateful to the stewards at the train underpass and the mandatory walk section, it was so nice to see a friendly face when I spotted Brian Dunn. We didn’t present very well the first time around, a few too many people around us and a little tension got in the way, not helped when Greyson was asked to trot again. Which he did, but the president of the veterinary was unsure why we had been asked to trot again (and so were we !) – a bit of confusion all around and then our Heart in the Mouth moment was over very quickly. Phew we got to continue to Loop 2. In no time I was headed out to the hill loop, this time reunited with Fiona who had arrived at the vet gate at almost the same time as we had. I stuck to my game plan and rode loop 2 very slowly and steadily, I was conscious of every stone and potential slip and trip. I suspect I rode too steadily ! but safe rather than sorry was the name of the game here, and I arrived back at the remote vet gate sound and well. Especially as some of the sections over the cobbles in the village were exceptionally slippery and although there is a lovely photo of us going under the archway in the village I look somewhat apprehensive – I was so terribly worried that Greyson would slip and fall. So into Vet Gate 2 where Very sadly at this stage Fiona vetted out. I was gutted for her – However she is justifiably proud of her incredible 4* horse Oliver and her team, and of course Fiona herself, for making it to a Championships. Something so many people can’t ever even imagine doing. We vetted quickly and made the most of the hold time to ensure Greyson was in perfect shape, with the help of Lee Clark who worked on him all day and Laurence Ridgeway my special farrier and crew. So out on to Loop 3, we were retracing our steps from Loop 1 as we headed back to the main Napoli venue. Greyson was just flying along, and obviously thoroughly enjoying himself. I felt so proud of him, the second his feet touched the turf he was just wanted to run. I struggled to keep him in check along the roadways and stony sections, but was determined to stick to our steady pace and just slowly increase speed loop on loop. It was fun arriving at back at the venue up the racetrack and having the two locations for the vet gates made the ride really varied. Again, Greyson was foot perfect at the vetting, with my husband Andy trotting him up beautifully for the vets. No pressure Andy ! Loop 4 was different all over again, partly down by the river but also through some lanes and some very twisty sections of woodland with tree routes, and you had to really pay attention to the marking and keeping balanced and collected. Greyson was going from strength to strength and I knew he was just loving it, cantering along with his tail high over his back. He charged into our final hold. I should at this stage also say thank you to the organisers and volunteers for the slosh bottles and water that was on course, it was really unusual to come across them on certain parts of the course and we were so grateful for the drinking water on course which Greyson made full use of , to the point where my crew couldn’t understand why he was so uninterested in our usual buckets as he had decided that the giant watering vats were much more appealing and he would charge straight to them. I remember holding my breath at the vetting as I realised that we would soon be out on our last loop if all went to plan. It did – and were in our final hold. I could scarcely believe it as we headed out on the final 20 kms and I love this beautiful photo of Greyson heading out off the racetrack, ear pricked and ready to go. I think the look on my face says much more than words can. I had a LOT of horse left, so we flew up the river and back again. We saw our entire crew and management team at the point where we turned around to head back up the river to the venue. As I rode up the racetrack and into the venue for the last time I was beaming – what a ride this horse had given me. We took our time before vetting and gave Lee a chance to make sure he was fully stretched and ready to trot, and he had drunk well, and was cool and calm. Then it was time to go to the vets – I could hardly breathe at all as I was walked with vet Sarah Coombs and Andy into the vetting. I almost did not dare to look at his trot up, but he was still looking wonderful. It seemed like we waited forever for the vets decision …….. we had passed. I was so shocked we had done it that I didn’t even cry ! 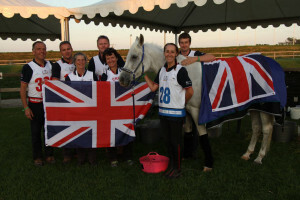 My exceptional horse Greyson, and my crew of Andy Thorne, Laurence Ridgeway, Lee Clark, along with Sarah Coombs (vet), Mary Stubbs (chef) and Kelvin Lymer (farrier) not to mention all the back up team at home – we had done it ! We got round a tough and fun course in our first ever Championships. I don’t think I will ever get over how it feels to know you have competed with the Best of your chosen sport, and to have ridden with great pride for your country. My beautiful, kind and talented LR Bold Greyson is now enjoying a much earned rest back home in Norfolk, waiting to see what 2016 will bring for us. Live The Dream …….